American rockers Airiel to play http://www.redsave.com/products/Become-a-Lord,-Lady,-Baron-or-Baroness,,21 [Sealand]'s first ever gig, live from the World's smallest independent state. It's such a unique place and we are honoured to be invited as the first people to actually get to play there. And to be made a Lord of Sealand is just unbelievable, I never thought I'd have a title! 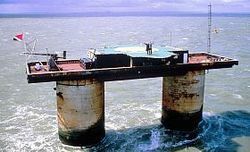 The world's smallest independent state, the Principality of Sealand, has invited top U.S. rockers Airiel to play an exclusive gig, live from the Royal Palace - six miles off the coast of the UK. The event will also mark the first use of Sealand's latest server technology, with a live webcam internet broadcast letting web users around the world watch for free. The Chicago-based foursome is considered the perfect choice to perform having just released their latest album entitled 'Battle of Sealand', in recognition of Prince Roy's heroic efforts to protect his island state. To acknowledge their contribution to the cultural development of http://www.redsave.com/products/Become-a-Lord,-Lady,-Baron-or-Baroness,,21 [Sealand], Airiel band members Chris DeBrizzio, Jeremy Wrenn, Cory Osborne and John Rungger have all been made honorary Lords of Sealand. Their new aristocratic titles will ensure that they benefit from all the perks members of the nobility the world over have long since enjoyed. The band has just returned from South America, where they played to a capacity crowd in Lima, Peru. With their unique brand of experimental rock, they will be sure to shake the former World War II fort turned micro-nation, to its foundations. "When we found out about the history of http://www.redsave.com/products/Become-a-Lord,-Lady,-Baron-or-Baroness,,21 [Sealand], and how much has happened there in such a short time, we had to name our album after one of its most triumphant moments," says Airiel guitarist Lord Chris deBrizzio. "It's such a unique place and we are honoured to be invited as the first people to actually get to play there. And to be made a Lord of Sealand is just unbelievable, I never thought I'd have a title!" The Battle of Sealand is arguably the most dramatic event in Sealand's brief but proud history. A mixed Germanic-Dutch force launched a daring raid on the principality, but was foiled by a brilliant counter attack, led by the founder and current ruler of Sealand, Prince Roy, involving an armed helicopter assault. The battle, thankfully, only lasted a matter of minutes and ended without casualties. Sealand has celebrated a number of firsts recently - having launched the world's first national online casino, Sealand Casino, and receiving backing from Russian investors to launch its first communications satellite. The micro-nation also celebrated its 40th year anniversary on the 2nd of September, commemorating the day that Prince Roy of Sealand exerted state authority on the island. The latest Principality of Sealand developments can be found at its official digital newspaper, Sealand News - sealandnews.com. On 2 September 1967, former English major Paddy Roy Bates formally occupied a former military fortress, created by Great Britain during World War II and subsequently abandoned to the jurisdiction of the High Seas. The Principality of Sealand's independence was upheld in a 1968 British court decision where the judge held that it stood in international waters and did not fall under the legal jurisdiction of the United Kingdom: giving birth to Sealand's national motto of E Mare Libertas, or "From the Sea, Freedom". Seven years later on 25 September 1975, Roy of Sealand proclaimed the Constitution of the Principality. Over time, other national treasures were developed, such as the flag of the Principality of Sealand, its national anthem, stamps, as well as gold and silver coins launched as Sealand Dollars. Finally, passports of the Principality of Sealand were issued to loyal subjects. Recent years have seen an impressive expansion in both social and industrial activity, with the Principality of Sealand developing a growing economic base, underscoring its long-standing membership of the international community of States.